All aboard for our last monthly party of 2018 at this brand new venue in the City. 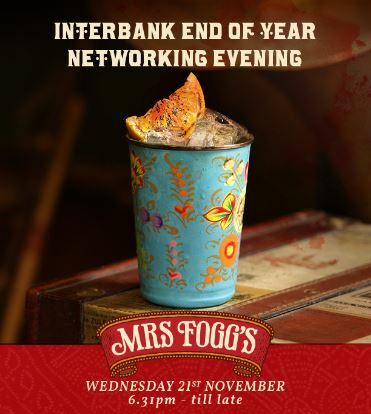 Interbank is hosting a networking evening on Wednesday 21st November 2018 from 6.30pm at Mrs Fogg’s, Broadgate Circle. This is a new exciting venue in the City which we have secured a space for the evening. Everyone is welcome and we continue to focus on encouraging our Women+ members to attend as part of a drive to increase presence and visibility. Our hosts this month will be Anna Cantwell (Nex) and Sonia Sawula (Credit Suisse).